Bu çalışmanın amacı okul örgütsel yapısı ile sınıf öğretmenlerinin proaktif davranışları arasındaki ilişkiyi incelemektir. Bu çalışmanın verileri 2013-2014 öğretim yılında Bolu il merkez ilçe sınırları içerisinde yer alan ilkokullarda görev yapan 295 sınıf öğretmeninden elde edilmiştir. Araştırmanın verileri mekanik okul yapısı, organik okul yapısı ve proaktif davranış ölçekleri kullanılarak elde edilmiştir. Verilerin analizinde aritmetik ortalama ve standart sapma, korelasyon ve regresyon analizi kullanılmıştır. Araştırmada mekanik okul yapısı ile proaktif davranış arasında negatif ve anlamlı ilişki, organik okul yapısı ile proaktif davranış arasında olumlu ve anlamlı ilişki bulunmuştur. The purpose of the present study was to explore the relationship between school organizational structure and classroom teachers’ proactive behaviors. Data in this study were collected from a total number of 295 classroom teachers utilizing the mechanistic structure, organic structure and proactive behaviors scales. Mean, standard deviation, correlation and regression test used in analysis of the data. Data analysis indicated that there was a significant negatively correlation between mechanistic school structure and proactive behavior, whereas there was a significant positively correlation between organic school structure and proactive behavior. Asgari, A., Silong, A. D., Ahmad, A., & Samah, B. A. (2008). The relationship between transfor- mational leadership behaviors, organizational support, trust in management and organizational citizenship behaviors. European Journal of Scientific Research, 23(2), 227–242. Belschak, F., den Hartog, D., & Fay, D. (2010). Exploring positive, negative, and contextdependent aspects of proactive behaviors at work. Journal of Occupational and Organizational Psychology, 83, 267-173. Bindl, U.,& Parker, S. (2010). Proactive work behavior: Forward-thinking and change-oriented action in organizations. In S. Zedeck (Ed. ), APA handbook of industrial and organizational psychology (Vol. 2, pp. 567-598). Washington, DC: American Psychological Association. Carpenter, M. , Bauer, T. & Erdoğan, B. (2013). Principles of Management: A Behavioral Appro- ach. Flat World Knowledge. Cerit, Y. (2013). Sınıf öğretmenlerinin proaktif davranışları sergileme düzeylerinin bazı demografik değişkenler açısından incelenmesi. ULEAD 2013 Annual Congress: International Congress on Research in Education, Mayıs. Cogliser, C. C.,& Schriesheim, C. A. (2000). Exploring work unit context and leader-member exc- hange: A multi-level perspective. Journal of Organizational Behavior, 21, 487-511. Conley, S. & You, S. (2014). Role stress revisited: Job structuring antecedents, work outcomes, and modera- ting effects of locus of control. Educational Management Administration & Leadership, 42(2), 184-206. Conley S and Glasman NS (2008) Fear, the school organization, and teacher evaluation. Educatio- nal Policy, 22(1), 63–85. Behavior.Entrepreneurship Theory and Practice, 16(1), 7-25. Crant, J. M. (2000). Proactive behavior in organizations. Journal of Management, 26, 435–462. Courtright J A, Fairhurst G T ve Rogers L E (1989) Interaction Patterns in Organic and Mechanic Systems. Academy of Management Journal, 32 (4), 773-802. De Dreu, C. K. W. (2006). When too little or too much hurts: Evidence for a curvilinear relationship between task conflict and innovation in teams. Journal of Management, 32 (1), 83-107. DiPaola, M. F.,& Hoy, W. K. (2005). School characteristics that foster organizational citizenship behavior. Journal of School Leadership, 15, 308-326. Fay, D.,& Sonnentag, S. (2012). Within-person Fluctuations of Proactive Behavior: How Affect and Experienced Competence Regulate Work behavior. Human Performance, 25(1), 72-93. Freund, A. & Drach-Zahavy, A. (2007). Organizational (role structuring) and personal (organizati- onal commitment and job involvement) factors: Do they predict interprofessional team effecti- veness?.Journal of Interprefessional Care, 21(3), 319-334. Ghitulescu, B. E. (2013). Making Change Happen: The Impact of Work Context on Adaptive and Proactive Behaviors.Journal of Applied Behavioral Science, 49(2), 206–245. Grant, A.M. and Ashford, S., (2008). The Dynamics of Proactivity at Work. Research in organiza- tional Behavior, 28, 3-34. Griffin, M. A., Neal, A., & Parker, S. K. (2007). A new model of work role performance: Positive be- havior in uncertain and interdependent contexts. Academy of Management Journal, 50, 327–347. Griffin, M. A., Parker, S. K., & Mason, C. (2010). Leader vision and the development of adaptive and proactive performance: A longitudinal study. Journal of Applied Psychology, 95, 174-182. Hirst, G., Knippenberg, D.V., Chen, C., & Sacramento, C.A. (2011). How Does Bureaucracy im- pact individual creativity? A Cross-level investigation of team contextual influences on goal orientation-creativity relationships. Academy of Management Journal, 54(3), 624-641. Hoy, W.K. & Miskel, C.G. (2010). Eğitim yönetimi: Teori, araştırma ve uygulama(çev. Ed. S. Tu- ran). Ankara: Nobel. Jogaratnam, G. & Tse, E. C. (2006). Entrepreneurial orientation and the structuring of organizations: Performance evidence from the Asian hotel industry. International Journal of Contemporary Hospitality Management, 18(6), 454-468. OECD. (2006). Demand-sensitive schooling. Evidence and issues. Paris: Organisation for Econo- mic Cooperation and Development (OECD). Hoy, W. K.,& Sweetland, S. R. (2001). Designing better schools: The meaning and nature of enab- ling school structure. Educational Administration Quarterly, 37, 296-321. McAllister, D.J., Kamdar, D., Morrison, E.W., & Turban, D.B. (2007). Disentanglingrole percepti- ons: How perceived role breadth, discretion, instrumentality, andefficacy relate to helping and taking charge. Journal of Applied Psychology, 92, 1200–1211. Miller R. J. & Rowan, B. (2006). Effects of organic management on student achievement. American Educational Research Journal, 43(2), 219-253. Parker, S.K. (1998). Enhancing role breadth self-efficacy: The roles of job enrichment and other organizational interventions. Journal of Applied Psychology, 83, 835–852. Parker, S. K., Bindl, U. K., & Strauss, K. (2010). Making things happen: A model of proactive mo- tivation. Journal of Management, 36, 827–856. Parker, S.,& Collins, C. (2010). Taking stock: Integrating and differentiating multiple proactive behaviors. Journal of Management, 36, 633-662. Parker, S., Williams, H., & Turner, N. (2006). Modeling the antecedents of proactive behaviorat work. Journal of Applied Psychology, 91, 636-652. Pearson, L. C.,& Moomaw, W. (2005). The relationship between teacher autonomy and stress,work satisfaction, empowerment, and professionalism. Educational Research Quarterly, 29, 37-53. Rasmussen, C. & Marrongella, K. (2006). Pedagogical content tools: Integrating student reasoning and mathematics in instruction. Journal for Research in Mathematics Education, 37(5), 388-423. Raub, S. (2008). Does bureaucracy kill individual initiative? The impact of structure on organi- zational citizenship behavior in the hospitality industry. International Journal of Hospitality Management, 27, 179–186. Rowan, B. (1990). Commitment and control: Alternative strategies for the organizational design of schools. In C. Cazden (Ed. ), Review of research in education(Vol. 16, pp. 353–389). Washing- ton, DC: American Educational Research Association. Sonnentag, S. & Kruel, U. (2006). Psychological detachment from work during off job time: The role of job stressors, job involvement, and recovery related self-efficacy. Europen Journal of Work and Organizational Psychology, 15(2), 197-217. Somech, A.,& Wenderow, M. (2006). The impact of participative and directive leadership on te- achers’ performance: The intervening effects of job structuring, decisions domain, and leader- member exchange. Educational Administration Quarterly, 42(5), 746-772. Stamper, C. L.,& Van Dyne, L.(2001). Work status and organizational citizenship behavior: A field studyof restaurant employees. Journal of Organizational Behavior, 22, 517-536. Thomas, J., Whitman, D.S., & Viswesvaran, C., (2010). Employee Proactivity in Organizations: A Comparative Meta-Analysis of Emergent Proactive Constructs. Journal of Occupational and Organizational Psychology, 83, 275-300. Thompson, J.A. (2005). Proactive Personality and Job Performance: A Social Capital Perspective. Journal of Applied Psychology, 90, 1011-1017. Van De Bunt, L. (2012). Leadership and situational antecedents of proactive behavior. University van Amsterdam.dare.uva.nl. Visscher, A. (2013). Introduction to organizational and management aspects of schoolls, in A. J. Visscher (Ed.) Managing Schools towards High Performance,(3-36). Taylor & Francis. Yücel, A.S., Koçak, C., ve Cula, S., An Analysis on Proactive-Reactive Personality Profiles in Stu- dent-Teacher Relationship Through The Metaphorical Thinking Approach. Eurasia Journal of Mathematics Science & Technology Education, 6(2), (2010), 129-137. Zhang, Z., Wang, M. and Shi, J. (2012). Leader-Follower Congruence in Proactive Personality and Work Outcomes: The Mediating Role of Leader-Member Exchange. Academy of Management Journal, 55(1), 111-130. ISNAD CERİT, Yusuf , AKGÜN, Nuri . "OKULUN ÖRGÜT YAPISI İLE SINIF ÖĞRETMENLERİNİN PROAKTİF DAVRANIŞLARI ARASINDAKİ İLİŞKİ". 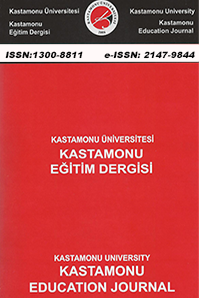 Kastamonu Eğitim Dergisi 23 / 4 (December 2015): 1789-1802.